TPC's investment will take us a long way toward achieving success with our E. coli O157:H7 cattle vaccine – the world's first. The vaccine is entering the North American market, where it is expected to have a positive impact on human health. President and CEO of Bioniche Life Sciences Inc. Founded in 1979, the Canadian Life Sciences firm Bioniche is located in Belleville, Ontario and is divided into three business units: Human Health, Animal Health, and Food Safety. It is through the ingenuity of the third unit that Bioniche has created a vaccine that will help the first. Bioniche has developed an E. coli cattle vaccine that reduces the amount of E. coli O157:H7 shed in their manure. The organism does not make cattle ill, but contaminates the environment, food and water supplies, causing human illness and death. E. coli O157:H7 outbreaks are responsible for over one hundred thousand human illnesses each year in North America. The vaccine, which prevents illness in humans by vaccinating healthy animals, is the first of its kind in the world. In 2001, Technology Partnerships Canada (TPC) entered into a $7.6 million Contribution Agreement with Bioniche to develop an E. coli O157:H7 cattle vaccine. The total project cost was $58.7 million. In December 2006, the Canadian Food Inspection Agency (CFIA) granted Bioniche a conditional license to sell its vaccine. Veterinarians can purchase the vaccine provided they assert in writing to Bioniche and to the CFIA that they are aware that the product is not fully licensed and that further efficacy studies are underway. In February 2008, the United States Department of Agriculture (USDA) told Bioniche that its vaccine is eligible for a conditional license. This license will give Bioniche full access to the U.S. market, provided that at least one step in the manufacturing takes place in the U.S. and that Bioniche does not use the trademarked name of the vaccine. The first commercial sale of Bioniche E. coli O157:H7 vaccine was in Clarksburg, Ontario, in September of 2007. At less than $10 per cow, the vaccine ends up costing approximately 2 cents per pound of finished beef at the retail end of the meat industry (grocery store). It is possible that Bioniche's E. coli O157:H7 vaccine has the capacity to be used for other harmful strains of E. coli, as well as to treat other animals. Studies are currently underway to examine other potential applications of this ground-breaking vaccine. Bioniche has been named one of Canada's Top Ten Life Sciences Companies for 2008. It remains a small company, employing approximately 200 people world-wide, and last year, Bioniche received the 2007 Animal Pharm Award in the category of Best New Veterinary Product – Livestock for its E. coli O157:H7 vaccine. Escherichia coli, commonly known as E. coli, is a bacterium found in the intestines of animals. However, a mutant strain, O157:H7, has been discovered in the intestines of cattle, deer, goats, and sheep. It is a zoonotic bacterium; a bacterium that is found in animals and can be transmitted to humans. In the case of E. coli O157:H7, this transmission is dangerous to humans. The human consumption of as few as 10 E. coli O157:H7 bacteria can result in serious illness or, in some cases, death. In 1995, Dr. Brett Finlay at the University of British Colombia discovered that E. coli O157:H7 secretes proteins, which allow the bacteria to adhere to and colonize the intestine of cattle. Following this discovery, the University of British Colombia partnered with the Alberta Research Council and the University of Saskatchewan's Vaccine & Infectious Disease Organization to develop useful technology from Dr. Finlay's discovery. Bioniche joined as commercial partner in 2000. Bioniche's E. coli vaccine works by stimulating the production of antibodies in cattle which prevent the attachment of the colonizing proteins. Without proteins to attach to, the bacteria cannot colonize and, therefore, they are passed through the intestine. Administered to cows as three doses, this vaccine significantly reduces the amount of E. coli O157:H7 present in both their intestines and their manure. E. coli O157:H7 is rarely found in the blood of cattle; meat is infected when intestines or dust from the haircoat come into contact with the beef at a stage in the meat-packing process. Another source of contamination is the result of increasing proximity between cattle and vegetable farms as well as the diversification of farms. Run-off during rainfall can spread the bacteria to neighbouring farms or crops. Also, feedlots present a problem since, with the large numbers of cows present, their manure is not composted for a long enough time to allow the heat of compost to destroy E. coli O157:H7. 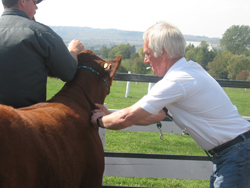 Additionally, direct human contact with cattle and other ruminant animals, such as at petting zoos or fairs, can result in the passing of the organism from animal to person.